This map is based on data from the Mars Orbiter Laser Altimeter (MOLA; Smith and others, 2001), an instrument on NASA’s Mars Global Surveyor (MGS) spacecraft (Albee and others, 2001). The image used for the base of this map represents more than 600 million measurements gathered between 1999 and 2001, adjusted for consistency (Neumann and others, 2001, 2003) and converted to planetary radii. These have been converted to elevations above the areoid as determined from a Martian gravity field solution GMM-2B (Lemoine and others, 2001), truncated to degree and order 50, and oriented according to current standards (see below). The average accuracy of each point is originally ~100 meters in horizontal position and ~1 meter in radius (Neumann and others, 2001). However, the total elevation uncertainty is at least ±3 m due to the global error in the areoid (±1.8 meters according to Lemoine and others ) and regional uncertainties in its shape (G.A. Neumann, written commun., 2002). References: * Albee, A.L., Arvidson, R.E., Palluconi, Frank, Thorpe, Thomas, 2001, Overview of the Mars Global Surveyor mission: Journal of Geophysical Research, v. 106, no. E10, p. 23,291–23,316. * de Vaucouleurs, Gerard, Davies, M.E., and Sturms, F.M., Jr., 1973, Mariner 9 areographic coordinate system, in Journal of Geophysical Research, v. 78, p. 4395–4404. * Duxbury, T.C., Kirk, R.L., Archinal, B.A., and Neumann, G.A., 2002, Mars Geodesy/Cartography Working Group recommendations on Mars cartographic constants and coordinate systems, in Joint International Symposium on Geospatial Theory, Processing and Applications, Ottawa, Canada, 2002 Commission IV, Working Group 9—Extraterrestrial Mapping, Proceedings: Ottawa, Canada, International Society for Photogrammetry and Remote Sensing [http://www.isprs.org/commission4/proceedings/paper.html]. * Greeley, Ronald, and Batson, R.M., 1990, Planetary mapping: Cambridge University Press, p. 274–275. 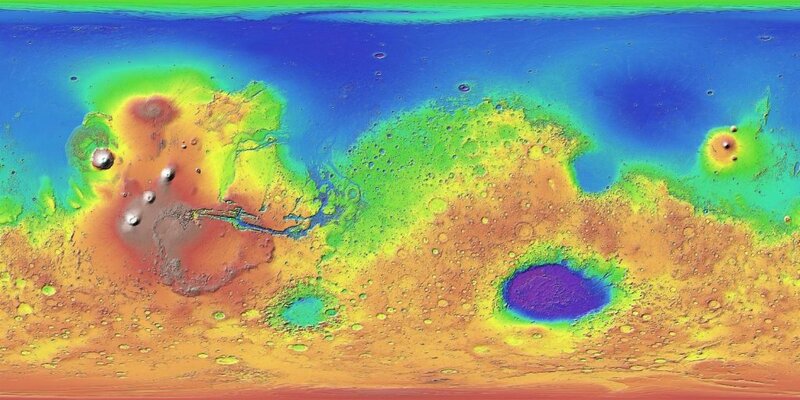 Lemoine, F.G., Smith, D.E., Rowlands, D.D., Zuber, M.T., Neumann, G.A., Chinn, D.S., Pavlis, D.E., 2001, An improved solution of the gravity field of Mars (GMM-2B) from Mars Global Surveyor: Journal of Geophysical Research, v. 106, no. E10, p. 23,359–23,376. * Neumann, G.A., Rowlands, D.D., Lemoine, F.G., Smith, D.E., and Zuber, M.T., 2001, Crossover analysis of Mars Orbiter Laser Altimeter data: Journal of Geophysical Research, v. 106, no. E10, p. 23,753–23,768. Neumann, G.A., Smith, D.E., and Zuber, M.T., 2003, "Two Mars years of clouds detected by the Mars Orbiter Laser Altimeter. ", Journal of Geophysical Research, Vol 108, No. E4, 5023, 2003. * Seidelmann, P.K. (chair), Abalakin, V.K., Bursa, Milan, Davies, M.E., De Bergh, Catherine, Lieske, J.H., Oberst, Juergen, Simon, J.L., Standish, E.M., Stooke, P.J., and Thomas, P.C., 2002, Report of the IAU/IAG Working Group on Cartographic Coordinates and Rotational Elements of the Planets and Satellites—2000: Celestial Mechanics and Dynamical Astronomy, v. 82, p. 83–110. * Smith, D.E., Sjogren, W.L., Tyler, G.L., Balmino, G., Lemoine, F.G., and Konopliv, A.S., 1999, The gravity field of Mars—Results from Mars Global Surveyor: Science, v. 286, p. 94–96. * Smith, D.E., Zuber, M.T., Frey, H.V., Garvin, J.B., Head, J.W., Muhleman, D.O., Pettengill, G.H., Phillips, R.J., Solomon, S.C., Zwally, H.J., Banerdt, W.B., Duxbury, T.C., Golombek, M.P., Lemoine, F.G., Neumann, G.A., Rowlands, D.D., Aharonson, Oded, Ford, P.G., Ivanov, A.B., Johnson, C.L., McGovern, P.J., Abshire, J.B., Afzal, R.S., and Sun, Xiaoli, 2001, Mars Orbiter Laser Altimeter—Experiment summary after the first year of global mapping of Mars: Journal of Geophysical Research, v. 106, no. E10, p. 23,689–23,722. * Wessel, Paul, and Smith, W.H.F., 1998, New, improved version of Generic Mapping Tools released: Eos, Transactions of the American Geophysical Union, v. 79, no. 47, p. 579. The Mars Orbiter Laser Altimeter (MOLA) produced a high-resolution global topographic model and geodetic framework that enables precise targeting, safe landing, and surface mobility to carry out exploratory activities. The average accuracy of each point is originally ~100 meters in horizontal position and ~1 meter in radius (Neumann and others, 2001). However, the total elevation uncertainty is at least ±3 m due to the global error in the areoid (±1.8 meters according to Lemoine and others ) and regional uncertainties in its shape (G.A. Neumann, written commun., 2002). The MOLA data were initially referenced to an internally consistent inertial coordinate system, derived from tracking of the MGS spacecraft. These values include the orientation of the north pole of Mars (including the effects of precession), the rotation rate of Mars, and a value for W0 of 176.630°, where W0 is the angle along the equator to the east, between the 0° meridian and the equator’s intersection with the celestial equator at the standard epoch J2000.0 (Seidelmann and others, 2002). This value of W0 was chosen (Duxbury and others, 2002) in order to place the 0° meridian through the center of the small (~500 m) crater Airy-0, within the crater Airy (Seidelmann and others, 2002; de Vaucouleurs and others, 1973). Longitude increases to the east and latitude is planetocentric as allowed by IAU/IAG standards (Seidelmann and others, 2002) and in accordance with current NASA and USGS standards (Duxbury and others, 2002). Data are very sparse near the two poles (above 87° north and below 87° south latitude) because these areas were sampled by only a few off-nadir altimetry tracks. Gaps between tracks of 1–2 km are common, and some gaps of up to 12 km occur near the equator. DEM points located in these gaps in MOLA data were filled by interpolation. The measurements were converted into a digital elevation model (DEM; G.A. Neumann, written commun., 2002; Neumann and others, 2001; Smith and others 2001) using Generic Mapping Tools software (Wessel and Smith, 1998), with a resolution of 128 pixels per degree. In projection, the pixels are 463 meters in size at the equator. To create the topographic base image, the original DEM was produced by the MOLA team in Simple Cylindrical projection with a resolution of 128 pixels per degree. A shaded relief was generated from the DEM with a sun angle of 45° from horizontal and a sun azimuth of 315°, as measured clockwise from north, and a vertical exaggeration of 100%. The DEM values were then mapped to a smooth global color look-up table. Note that the chosen color scheme simply represents elevation changes and is not intended to imply anything about surface characteristics (for example, past or current presence of water or ice). Elevations above the areoid as determined from a Martian gravity field solution GMM-2B (Lemoine and others, 2001).